<!-white-> Why does God ask questions? <!-purple-> "And the eyes of them both were opened, and they knew that they were naked, and they sewed fig leaves together, and made themselves aprons"
What does it mean that their eyes were opened? It simply means that they had an awareness of their spiritual, mental, and physical condition. Spiritually, they were able to discern between God and Lucifer and between good and evil (they were like gods in symbolism). One can have literal eyes to see physical reality but not perceive spiritual reality. God told Israel of Glory through Moses, <!-red-> "...yet the Lord hath not given you an heart to perceive, and eyes to see, and ears to hear, unto this day"
(Deuteronomy 29:4). <!-black-> And God told Ezekiel, <!-red-> "Son of man, thou dwellest in the midst of a rebellious house, which have eyes to see, and see not, they have ears to hear, and hear not- for they are a rebellious house"
<!-black-> How can that be relevant? Do you and I have spiritual eyes to see? Can we see God spiritually as He truly is? How we spiritually see God is very important to our salvation and sanctification. Some of us may see God in the image of our earthly father but some fathers leave a lot to be desired in that respect so that is not a good perspective. Rather, we should see God in the image of Jesus Christ, God the Son. 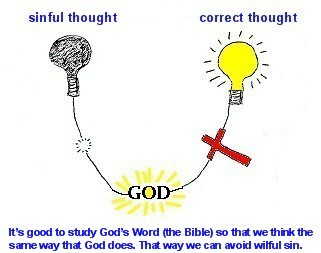 The more we study and learn about Jesus from the bible, the easier it becomes to have a spiritually balanced and healthy view of God. One might be inclined to ask: why do I have to suffer for the sin of Adam (who made mankind fall into sin)? He existed long before I was born and I don't recognize him as any kind of a person who could have possibly represented me. I certainly never gave my control to anything like that set of circumstances. It seems like the deck (of game playing cards) was stacked against me before I was born. Do you have any scripture that proves that Adam was my representative to God? <!-black-> Adam was our grandfather whether we like it or not. Yes, he was our ambassador and representative to God on our behalf for the human race, before any of us were born. You and I did not have a "say so" in the matter and God never asked any of us for our opinion about the matter. Who made him my representative? God did. If you have a problem with that, take it up with God because it is His universe and His earth and He can do anything that He wants to. (Numbers 32:9-13). Twelve spies were sent from the Israelites into the land of Canaan. Those 12 individuals were delegated representatives of 2 or 3 million Israelites. God recognized it so. When the spies had completed their mission they returned to the Israelites and 10 of them gave a negative report. They spake on behalf of the multitude. Those 10 individuals influenced the people of Israel to defy the will of God. As in the case of Adam, God's judgment fell. In the same way, we can see that representation is affirmed in the Word of God and that Adam was truly a delegated representative of the entire human race on mankind's behalf to God. <!-purple-> "For since by man came death, by Man came also the resurrection of the dead. For as in Adam all die, even so in Christ shall all be made alive..."
<!-purple-> "And so it is written, the first man Adam was made a living soul; the last Adam was made a quickening spirit. Howbeit that was not first which is spiritual, but that which is natural; and afterward that which is spiritual. The first man is of the earth, earthy: the second man is the Lord from heaven. As is the earthy, such are they also that are earthy: and as is the heavenly, such are they also that are heavenly. And as we have borne the image of the earthy, we shall also bear the image of the heavenly"
On the sixth day of creation after God had created mankind and the animals, He said that it was good. But things changed after the fall of mankind into sin. Evil and sin are now a part of the equation. Can you elaborate on that? I will try. <!-black-> It appears that original sin (the sin nature) or human depravity became a part of the human condition upon the fall of mankind. What is it? It is the basic sin nature of mankind passed down from Adam from one generation to another. It is mankind's natural tendency to sin. The pull is always downward. <!-black-> Many folks believe that inherited human nature is inclined towards good and it can be improved upon by good works. Some want to build a utopia on this earth in it's present condition. Some believe that if we can improve mankind's environment and heredity then mankind's inner nature will improve. Some want to start a colony on another planet away from the earth to prove their theory. Modernism, humanism, communism, and to some degree, socialism, seek to improve the overall condition of mankind. Some religions assist mankind in his quest towards self improvement. Some cults teach that inborn human nature is totally good and deny that sin exists. Some folks believe that mankind, before the flood, was trying to better itself to bring Heaven to earth- to establish their own Millennium of Peace through their own efforts without the help of God. But mankind has never been able to do this. Why? The answer is Satan, sin, and human depravity. Mankind forfeited his utopia in the Garden of Eden when the choice was made to accept Satan over God. Thereafter, no utopia was ever possible. And to make matters worse, one after another, individuals died. No matter how hard mankind tried, he could not escape the curse of God. There would be no Millennium of Peace without God's help. Evil, sin, and depravity were affecting the human race. <!-red-> "...the imagination of man's heart is evil from his youth..."
<!-purple-> "Behold, I was shapen in iniquity, and in sin did my mother conceive me"
<!-red-> "The heart is deceitful above all things, and desperately wicked; Who can know it? I the Lord search the heart, I try the reins, even to give every man according to his ways, and according to the fruit of his doings"
<!-purple-> "...there is none righteous, no, not one..."
<!-purple-> "And you hath he quickened, who were dead in trespasses and sins: wherein in time past ye walked according to the course of this world, according to the prince of the power of the air, the spirit that now worketh in the children of disobedience: among whom also we all had our conversation in times past in the lusts of our flesh, fulfilling the desires of the flesh and of the mind; and were by nature the children of wrath, even as others"
<!-black-> Romans chapter 7, the way that I understand it, deals with original sin and depravity. <!-black-> It appears to me that the condition of mankind, today, is inclined towards sin and towards evil. As a result of it, in the past, it appears that mankind got so bad that God had to send the great flood so mankind could start all over again. A preacher and an agnostic were discussing God. The agnostic asked: "Why are there so many messed up lives if God is such a powerful God? It looks like He would do something about the chaos in the world if He really could." <!-black-> At that moment a small boy walked by, caked with mud. A recent rain had left puddles everywhere, and it appeared the boy had managed to walk through every one of them. The preacher asked the cynic: "Why do you suppose that little boy is so filthy, since there is so much soap and water available?" <!-black-> All the soap and water in the world won't clean one square inch of filth if it isn't applied. Likewise, the moral sludge on the human race is not there because of a shortage of a cleansing agent. The little boy liked mud puddles and mud. Our problem is our affinity for sin. <!-black-> History's pages are soiled with man's love for mud. When God said, "Don't go near the water," we couldn't resist the urge to splash. The propensity for sin is something we're born with. The desire for the down and dirty appeals to us. God's words: "Thou shalt not," makes us curious about the forbidden fruit. Temptation sets in. Satan whispers in our ear to do it because God is not watching. <!-black-> Thus begins the process of ignoring soap and embracing mud. <!-purple-> "But every man is tempted, when he is drawn away of his own lust, and enticed. Then when lust hath conceived, it bringeth forth sin: and sin, when it is finished, bringeth forth death. Do not err, my beloved brethren"
<!-black-> Soap or mud? It's a choice no one can make for you...not even God. <!-black-> A true Christian has to deal with the world (evil world system), the flesh (the carnal nature of man), and the devil (with Satan's oppression and persecution) to be an overcomer on this earth in order to make it to Heaven. It appears that God leaves a slice of depravity in the heart of every born again Christian. Why? Because the Christian life is an uphill climb and not a downhill coast. God wants us to depend on Him every step of the way. We should not be complacent in self sufficiency. 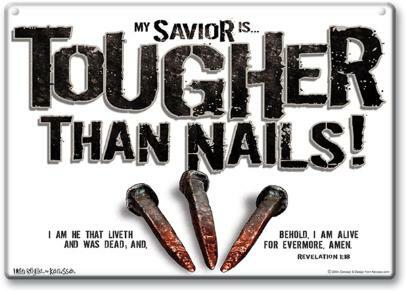 God wants us to fight- onward Christian soldiers! <!-purple-> "And they heard the voice of the Lord God walking in the garden in the cool of the day: and Adam and his wife hid themselves from the presence of the Lord God amongst the trees of the garden. And the Lord God called unto Adam, and said unto him, where art thou?" <!-black-> The word for "voice" in Hebrew is qowl meaning "sound", so Adam and Eve heard the sound of the Lord walking in the Garden of Eden. God was friendly with them. Likewise, He is friendly with you and I when sin is not present. <!-black-> Adam and Eve walked and talked with God. God was their friend and much, much more. In like manner, redeemed mankind has a close and loving relationship with a very personal God. I imagine in Heaven this kind of fellowship will take place with God there. <!-black-> It has been said that before the Fall of Man, God walked with mankind; but after the Fall of Man, mankind walked with God. <!-black-> But Adam and Eve's friendship with God ended. Why? Because they betrayed Him. Relationships are based upon mutual respect, love, and trust and when that is broken, the relationship is ended. And that is what sin does- it splits and destroys. And that is why it is so dangerous. <!-black-> Why does God ask questions? <!-black-> Since God is omniscient or all knowing, He knew where they were. When God asks you or I a question it is not because He is seeking information. It is because He wants you and I to talk to Him, as our loving Heavenly Father, about what is wrong in our life. Now, I want to talk to you about the ownership principle. Who owns you, God or Satan? Why did God walk in the garden in the cool of the day? God owned Adam and Eve. He walked in the garden in the cool of the day to show love and kindness to them and to have fellowship with them. <!-black-> Does the bible really teach our ownership by God or Satan or have I made the whole thing up? I do not want you to believe me or any other teacher on any biblical matter (because there will be false teachers who come into God's flock to lead many away captive by false doctrine)- rather, I want you to believe God's Word and what He has to say. If God says it- it is true. If He has not said it- then it is either false and/or somebody's opinion. So check out any teaching in God's word. That way you will know for yourself if a matter is true or not. <!-black-> To begin with Satan lays claim to every person who is alive on planet earth. He claims you and he claims me. However, God claims a few who belong to Him (a remnant if you please). Now, let us take a look at some "ownership" scriptures that bring this nugget of truth to the surface for us to examine. <!-purple-> "Now before the feast of the passover, when Jesus knew that his hour was come that He should depart out of this world unto the Father, having loved His own which were in the world, He loved them unto the end"
<!-purple-> "Nevertheless the foundation of God standeth sure, having this seal, The Lord knoweth them that are His. And, let every one that nameth the name of Christ depart from iniquity"
<!-red-> "I am the good shepherd, and know My sheep, and am known of Mine. As the Father knoweth Me, even so know I the Father: and I lay down my life for the sheep"
<!-purple-> "Now if any man have not the Spirit of Christ, he is none of His"
<!-purple-> "Behold, what manner of love the Father hath bestowed upon us, that we should be called the sons of God: therefore the world knoweth us not, because it knew Him not"
"But as many as received Him, to them gave He power to become the sons of God, even to them that believe on His name: Which were born, not of blood, nor of the will of the flesh, nor of the will of man, but of God"
"And we know that all things work together for good to them that love God, to them who are the called according to His purpose. For whom He did foreknow, He also did predestinate to be conformed to the image of His Son, that He might be the Firstborn among many brethren. Moreover whom He did predestinate, them He also called: and whom He called, them He also justified: and whom He justified, them He also glorified"
"Among whom are ye also the called of Jesus Christ"
<!-purple-> "Take heed therefore unto yourselves, and to all the flock, over the which the Holy Ghost hath made you overseers, to feed the church of God, which he hath purchased with his own blood"
"What? know ye not that your body is the temple of the Holy Ghost which is in you, which ye have of God, and ye are not your own? For ye are bought with a price: therefore glorify God in your body, and in your spirit, which are God's"
(1 Corinthians 6:19 & 20). "For he that is called in the Lord, being a servant, is the Lord's freeman: likewise also he that is called, being free, is Christ's servant. Ye are bought with a price; be not ye the servants of men. Brethren, let every man, wherein he is called, therein abide with God"
<!-purple-> "Then certain of the vagabond Jews, exorcists, took upon them to call over them which had evil spirits the name of the Lord Jesus, saying, we adjure you by Jesus whom Paul preacheth." "And there were seven sons of one Sceva, a Jew, and chief of the priests, which did so. And the evil spirit answered and said, Jesus I know, and Paul I know; but who are ye? And the man in whom the evil spirit was leaped on them, and overcame them, and prevailed against them, so that they fled out of that house naked and wounded.And this was known to all the Jews and Greeks also dwelling at Ephesus; and fear fell on them all, and the name of the Lord Jesus was magnified. And many that believed came, and confessed, and shewed their deeds"
<!-black-> The above scriptures become clear when one understands them in the light of ownership. Here you have unsaved people- people owned by Satan going around casting out Satan's demons by the POWER that is in Jesus' magnificent name. Satan's kingdom is being divided against itself and will fall if allowed to continue. The demon acknowledges that Jesus and Paul are genuine and thus on God's side. But then puts a stop to people he owns who have no business doing what they are doing. <!-purple-> "Yet Michael the archangel, when contending with the devil- he disputed about the body of Moses, durst not bring against him a railing accusation, but said, The Lord rebuke thee"
<!-black-> The above scripture also becomes clear when one understands it in the light of ownership. Because Moses was one time a murderer and idol worshiper, he belonged to Satan. However, Moses changed sides and was then owned by God. The matter that Moses belonged to God was so obvious and cut and dry that Michael did not pay the controversy much serious logical attention. But you can see that it meant a whole lot emotionally to Satan! Moses had been used by God to thwart Satan's plans- this seriously hurt Satan's pride! Satan wanted vengeance and wanted to discredit Moses even after he was dead. But God would not permit it. God has greater power and authority than Satan does. <!-purple-> "Esaias also crieth concerning Israel, Though the number of the children of Israel be as the sand of the sea, a remnant shall be saved: For he will finish the work, and cut it short in righteousness: because a short work will the Lord make upon the earth"
<!-black-> In the above scripture God deals with a remnant in regards to ownership. This principle of His always remains constant. Satan's forces have God's forces out-numbered on planet earth. There are more unsaved than saved folks. Satan claims that he owns all humanity- but God has a few folks who love Him for who He is. Since we understand this we do not have to be overwhelmed by sheer force of numbers against us because God helps us. <!-black-> A person cannot "do any kind of work" to change masters. In other words some think that "if you do something" then you can switch masters and so now you will no longer belong to Satan but now you will belong to God. The cults erroneously teach that salvation can be accomplished by works, however, the Bible teaches that salvation is offered by God thru grace only and that it is a free gift from Him. <!-black-> You and I can have a lot to say about who our master is. God has given to modern mankind the freedom of choice. Each of us can choose God to be our Master and be His love slave (servant). This is the best and wisest choice. <!-red-> Then said Jesus again unto them, "I go My way, and ye shall (literally) seek Me, and shall die in your sins: whither I go, ye cannot come"
<!-black-> That is why in all gospel leaflets or salvation tracts (that are printed in regards to the 4 spiritual laws)- each one starts with this type of individual being in a spiritually "lost condition" in need of a Saviour. If a person does not know that he or she is lost then that person will not willfully seek a solution for his or her lost condition. And that solution is to accept Jesus Christ. <!-black-> "Spiritually lost" means, from God's point of view, that a person belongs to Satan. That person is spiritually lost to God. And it is Satan's job to keep a person in unbelief and ignorance so that person will not accept Jesus Christ as his or her solution to their sin problem. Hence, Satan's will is that person will physically die eventually in his or her unsaved condition. He or she will die in his or her sins. Then Satan's ownership of that person is sealed and that person is eternally destined for Satan's destination: a lake of fire called hell. That person has been eternally lost to God. <!-blue-> B. <!-black-> By choice. Satan does have servants who choose to love and serve him also. Most of these folks are demon possessed by their own choice and live "secret lives" not seen by the general public...these are his willful servants who do Satan's will and carry out his evil plans and schemes on purpose. Satan has his evil servants in every occupation. If you are owned by Satan you can change your ownership to ownership by God. Some unsaved folks think that they are "good folk" and that during their lifetime their good deeds have added up to more than their evil deeds so therefore, they have a ticket to Heaven when they die. <!-black-> Thinking yourself righteous does not make it so. This is called self-righteousness. The bible says: <!-purple-> "There is a way which seemeth right unto a man, but the end thereof are the ways of death"
<!-black-> You have to come God's way. You cannot come your own way. And God's way is the way of the cross through the shed blood of Jesus Christ only. <!-black-> Even though it is Satan's will for a person to belong to Satan, here is the good news: (and you can read about this in any of the 4 spiritual laws tracts) you do not have to belong to Satan. Instead, you can belong to God. God loves you. He died on the cross in your place and God wants you to repent of your sins and turn to Him. Even though you may have gone your own way like a lost sheep, He wants you to invite Him to come and live in your heart and He wants to live on the throne of your heart. He wants to possess you with Himself- to possess you with love and kindness and other-centeredness. God wants you to be His love slave (or servant). If you belong to Satan, God wants you to change sides. <!-black-> You must decide to choose God on purpose- with Satan, death, and depravity against you, it is an uphill swim and " not a downhill coast for you. No one is going to get to heaven by accident. And no one is going to get to Heaven without God's help. <!-black-> There is spiritual power in the blood of Jesus Christ- this is called resurrection or redemption power- this is God's enabling in helping us change sides. God has to enable a believer to change sides and God has to enable a believer to live a victorious life after that decision has been made. One can't simply "turn over a new leaf." It has to be God's work (on the inside of a person or in their heart) and also man's work. It is not just one-sided. It involves man's choice and God's power and enabling. <!-black-> And once you have changed sides Satan will forever want you back. 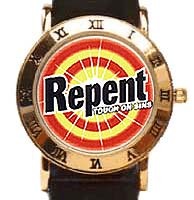 So be on your guard because "old slew foot" will place temptations in your pathway and entice you to sin against God and then tempt you to sin and remain unrepentant towards Christ in the hopes of getting you back again on his side. <!-black-> Because of the ownership seal on a person's heart, it is impossible for a person to be God possessed and demon possessed at the same time. One or the other has ownership- there is no joint custody over one's soul. Who owns you, God or Satan? Whose side are you on? God's side or Satan's side? There is no middle or neutral ground- you are either on one side or the other. <!-black-> How do you change sides? <!-purple-> "And the scripture was fulfilled which saith, Abraham believed God, and it was imputed unto him for righteousness: and he was called the Friend of God." (Romans 12: 1 & 2). "But ye are a chosen generation, a royal priesthood, an holy nation, a peculiar people; that ye should shew forth the praises of him who hath called you out of darkness into his marvellous light"
How did I change sides? I joined a Christian Bible study group on board an aircraft carrier while at sea. One night we formed a circle of men holding hands with one another and all prayed out loud at the same time. I repented of my sins and invited Jesus Christ to come into my heart. I did my part. Then He did His part: He came into my heart literally. I felt Him do this. And he changed my nature on the inside. He gave me peace in my heart where there was no peace before. He cleared my conscious mind of guilt. He gave me a reason for living. He created a desire in my heart for God- a desire to read and study His word and a desire to go to church where there was none before. I then knew and understood with the help of my friends there that I had changed sides. I changed from Satan's side to God's side. And after over 50 years of being on God's side I still have that wonderful peace in my heart that only He can give me. And I have no regrets at all about choosing God's side. <!-black-> If you do not love God then you are invited to change sides right now. Remember, not to decide (whose side you are on) is to decide...(because then you are on Satan's side by default-- Satan claims you). To change sides simply say a prayer of sincere repentance like I did. This will open the door to your heart and Jesus will take away the ugly black sin there and replace it with Himself- this is what is called the "born again" experience and this is what makes people "Christians"
(John 3:3). If you need help saying this prayer I recommend that you contact a minister of a bible believing church and talk to him.